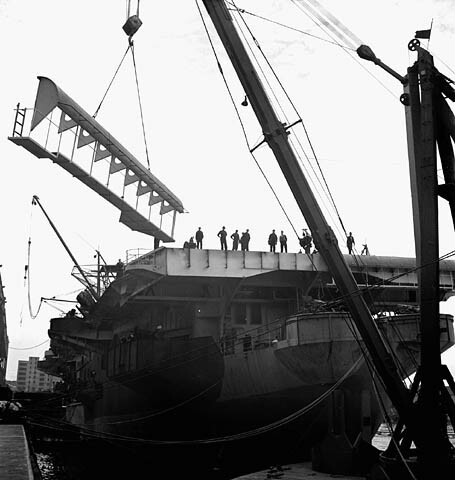 All of the new aircraft carriers built for transfer to the Royal Navy required modification and alteration in order to conform to Admiralty requirements; British dockyards were at full capacity and could only handle four out of the twenty-three that formed the second batch of Bogue class carriers being supplied under the Lend-lease agreement. 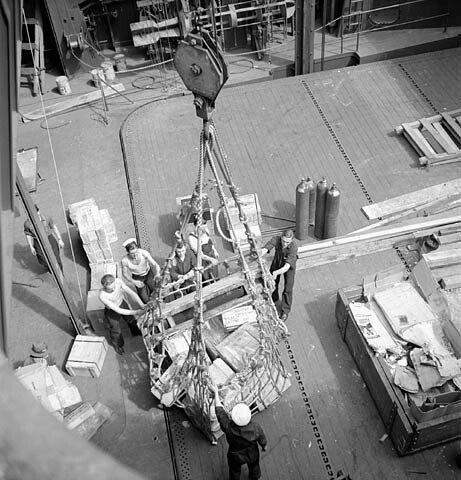 The Canadian Government agreed to fund the necessary work in a Canadian yard, enabling the 18 ships to be operational on leaving the Pacific for the UK. 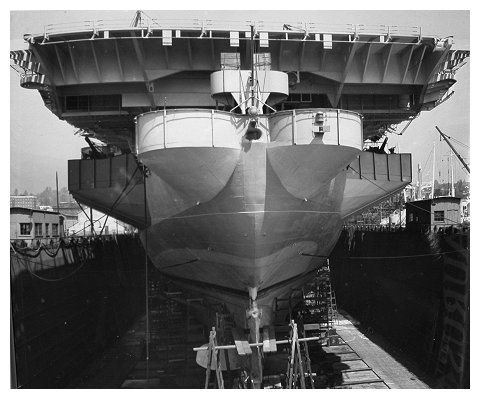 The contract was awarded to the Burrard Dry-Dock Co Ltd of North Vancouver; the completed vessels arriving there from Portland and Seattle at a steady rate of one or two a month starting in July 1943. Planning allowed for 45 day programme with as many as 6 ships in hand at one time, the ships moving through the yard from berth to berth as specific tasks were completed. This created a serious problem initially as power was only available at two of the eight berths, towards the end of the programme this number had risen to four. 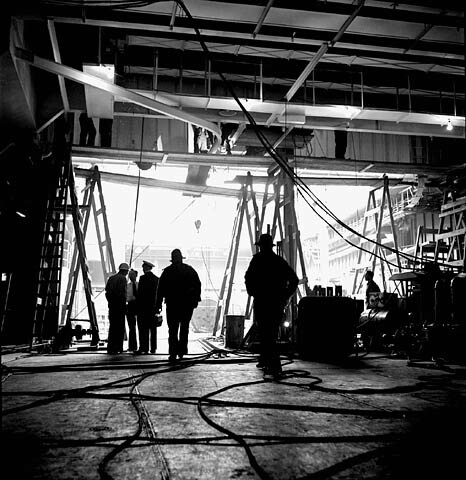 The work entailed 150 separate modifications which included extending the flight deck by 15 feet at the stern, and making major changes to the aviation fuel stowage and hangar safety measures. 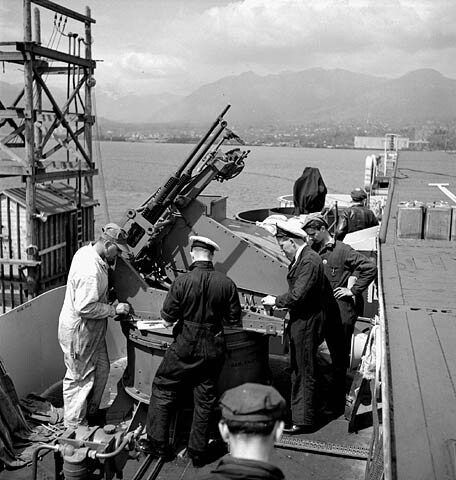 None of the work carried out at Vancouver was designed to equip the CVE for any specific role; all the vessels were delivered as ‘general purpose’ carriers able to operate American Torpedo Bombers and fighter aircraft that were in use with the Royal Navy Modification into the Assault and ASW specific roles was carried out in the UK after delivery. Work on the first ten vessels was to take far longer than the planned 45 day rotation; this delay was caused by defective Low Pressure Turbine Rotors. Repairs entailed the Turbine Rotor being removed and sent to the makers, Messrs. Allis Chalmers in Milwaukee, for partial re-blading, returned to Vancouver and refitted. On average this operation required at least four weeks. 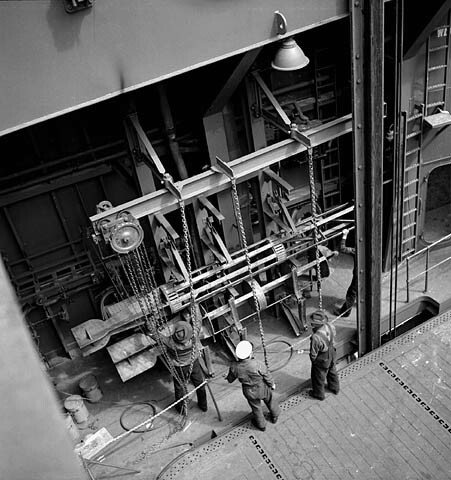 In later ships the alterations to the turbines were done by the U.S. Shipbuilders. 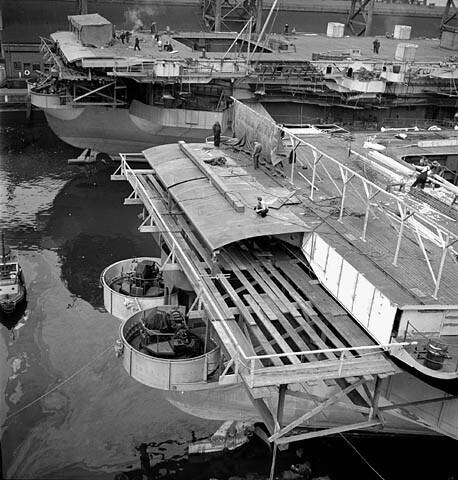 All the CVE’s required dry-docking, and initially all were to be fitted with Asdic equipment and additional sea valves; the first ten ships were docked using the Floating Dock at Burrards Dry-Dock, North Yard. This work was done in the middle of the programme so these ships, which were awaiting replacement LP turbines, had to be moved between yards by tugs. From ARBITER onwards the fitting of Asdic was cancelled and the rotor issued had been corrected before leaving the builder’s yards; these ships were docked at the RCN naval base at Esquimalt after the Burrards work had been finished. 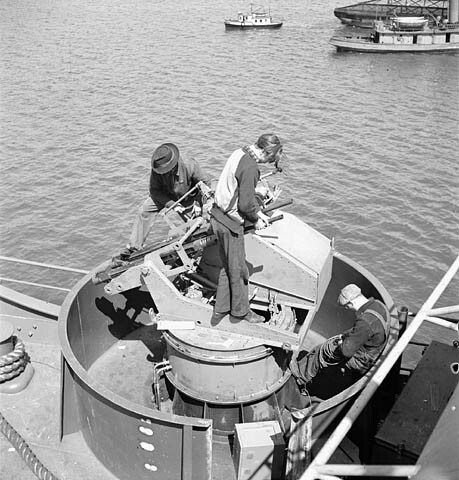 In April 1944, instructions were received to remove all the single Oerlikon Guns on the Gallery Deck and foc’sle deck, and substitute fourteen Twin Mountings. This affected the last five ships PUNCHER, REAPER, THANE, PATROLLER and RANEE and the programme was extended by 10 days; the increased time was made full use of by completing the majority of the items which had originally been cancelled. 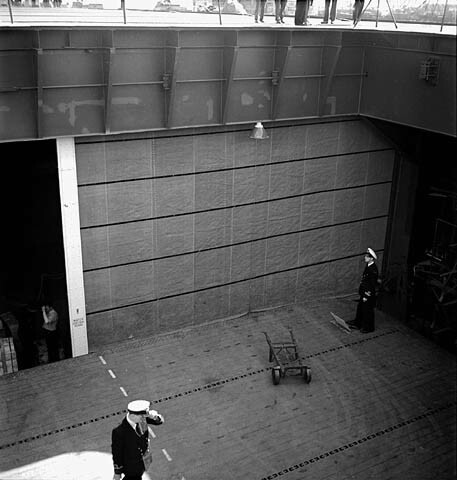 HMS NABOB in the floating dock at Burrard’s North Yard, she was docked between the 24th and the 27th of November 1943. Images: VR995.30.08 & VR995.30.22 copyright CFB Esquimalt Naval & Military Museum. Ships modified by Burrard Dry-Dock Co.
Should have arrived in Vancouver in October, between SHAH & NABOB but instead undertook a ferry voyage to India. 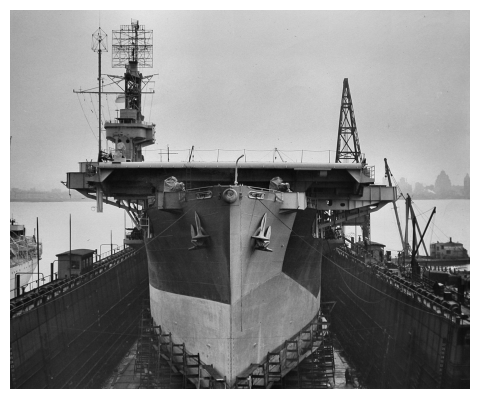 After limited alteration and working-up in the Seattle area, she sailed on 22-Nov-43. Released from ferry duty returned to Vancouver to complete alterations.